The University of Arizona has hired Noam Chomsky, a leftist who has defended communist regimes and met with the leaders of terrorist group Hizbullah, to teach a course for undergraduates titled “What is Politics?”, a government watchdog group reported. The university is paying the 89-year-old Chomsky $250,000 per year through 2020, Judicial Watch said. The money to pay Chomsky comes from tuition dollars, grants, contracts and other funds generated by the public institution, the records show. 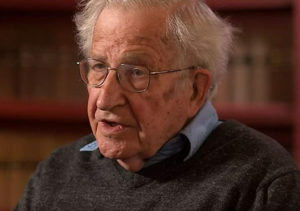 “The university’s arrangement with Chomsky has outraged many, especially those with connections to the school,” Judicial Watch noted. Bevan Olyphant, a former Green Berets who taught a leadership class in the honors program at the University of Arizona, said he was paid $1,500 a semester and says a full engineering professor at the university receives an average annual salary of $80,000. Olyphant told Judicial Watch he made a request that the university bring in some conservative speakers: “We can’t do that. We would have a riot,” Olyphant said the university’s response was.